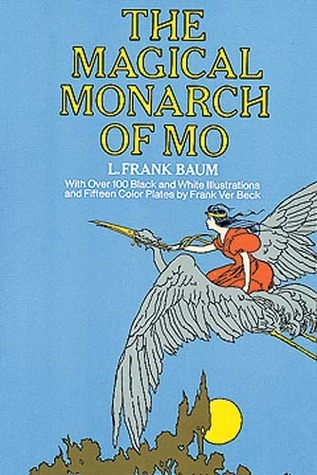 L Frank Baum wrote not only the Oz books, which are still wonderful to read, but he created whole other worlds, such as The Surprising Adventures of the Magical Monarch of Mo and His People. Even though the inhabitants of this magical land are, in effect, immortal, they still wind up having fantastic adventures. In one of my favorites, there is even a sly comment on the theory of evolution. Prince Zingle is carried by his giant kite to a strange land peopled by dressed-up monkeys who speak a strange language. These monkeys throw peanuts and cocoanuts at the poor prince without understanding a word he says:"Sweet!" grunted a man-monkey standing beside her, "he's the ugliest looking brute I ever saw! Scarcely has any hair on him at all, and no tail, and very little chin. I wonder where on earth the creature came from? ""It may be one of those beings from whom our race is descended," said another onlooker. "The professors say we evolved from some primitive creature of this sort. ""Heaven forbid!" cried a dandy-monkey, whose collar was so high that it kept tipping his hat over his eyes. "If I thought such a creature as that was one of my forefathers, I should commit suicide at once. "And, a few paragraphs later:Not knowing what he said, none of the monkeys paid any attention to this question. But one of the professor-monkeys appeared to listen attentively, and remarked to friend: "There seems to be a smoothness and variety of sound in his speech that indicates that he possesses some sort of language. Had I time to study this brute, I might learn his method of communicating with his fellows. Indeed, there is a possibility that he may turn out to be the missing link. "Baum was endlessly inventive, and his inventions have managed to stand the test of time. After disliking Enchanted Island of Yew, this book is next in this collection I own and this was far better. I'm in the non-Oz books of Baum now and noticing they are either good and just not worth it anymore. This one was good. I liked the Purple Dragon. Can't help but laugh at Princess Pattycake's name (Roger Rabbit has changed that name's meaning for me). Omg I loved this! It was so good to read. It has that old fashioned feel as Baum's books do. This collection of short stories is a definite favourite! Each story was so good. There is violence such as, A dragon biting the head off a king, a king kicking a dog and A monster cutting of a princes arms and head with a claw. More talk of a father cutting off his childrens heads etc so its not exactly child friendly. There was one story I rather really liked as it was what im calling Baum's version of Alice in Wonderland. Its called, "THE DUCHESS BREDENBUTTA'S VISIT TO TURVYLAND".Still this book will be treasured. I love also that my copy is quite well worn/well read. It gives it that pre-loved feel. I probably first read this book when I was seven or eight years old, when it was my great fortune that Dover reprinted several of L. Frank Baum's non-Oz fantasies in easy-to-afford paperback editions. Although this wasn't my favorite of the bunch, I always liked The Magical Monarch of Mo, and I'm pleased to find out - twenty-five years later - that I still find it very enjoyable. These stories find Baum in transition as a storyteller; they were originally published as A New Wonderland in 1900, and they were slightly revised and reprinted as Mo in 1903. Consequently, they show a stage of Baum's evolution that clearly predates The Wonderful Wizard of Oz; he's playing, here, with established European fairy tale figures and motifs (princes, princesses, dragons, giants, and so on) and just barely turning them on their head. It's not as significant, nor as Americanized, a shift as the "fairy tale" he creates with Wizard, but it's far more Baum's own thing than his 1896 Mother Goose in Prose. There's a very pleasing amount of his punning humor and pragmatic magical logic in The Magical Monarch of Mo - enough, in fact, that you can clearly identify this as writing by the far more famous and individually styled author of almost twenty years later. Of the fourteen "surprises" (not all of which are really long enough or deep enough to qualify as individual stories), some are quite forgettable, while one or two probably could have been left out to the book's benefit. The best of them, though, are marvelously nonsensical: the adventure of the King's missing head, the Prince's fight against the Gigaboo, and the fight with the Purple Dragon. Any one of these show off the great potential Baum had at that moment in time, which he would soon find a way to transmit directly into his own, distinctly American fairy stories of Oz. There are some early Oz characters in the making within the Mo stories. Quirky and very random but enjoyed reading this. I thought this one was sillier than his other books, but I enjoyed it. It was primarily about the King of Mo and his royal family. The chapters are called "surprises" and I love the details in it. Like how everything the citizens of Mo need grow on trees, whether it be bicycles, swords or animal crackers. No citizen of Mo dies, though wild beast can die. The names were amusing like Duchess Bredenbutter, or the Chamberlain Nufsed. They have a river of root beer and one of milk, and an island of fruitcake. This book strangely feels like it was written for an audience younger than the Oz books. That's strange because violence seems to abound in it! People are getting their limbs or head cut off right, left and center; an entire country gets destroyed; a son tries to imprison his father to steal his throne; a woman get given drugs to make her temperament better against her will and last but not least a dog gets smacked around. Still seemed like a place I wouldn't mind living (candy growing on trees? Sign me up! )but I don't think I'll be reading this one again (It's no Oz). I thought I'd read and loved everything by L. Frank Baum, but I missed the MMM.How could that happen?Anyway, I loved this collection of stories about King Mo and his family who inhabit a world somewhat like OZ, but different.Hilarious characters who do wrong, but make it right. Rivers of milk and trees laden with whatever one needs. Always the ability to undo what's been done.I so wish I'd read this during my Baum period (1958-1962), but so glad to meet and read it at age 66.The illustrations are wonderful, too.Go, Mo! I LOVE this book. its filled with fantasy and fiction and it takes place in a land where no one dies and you don't need money because every thing grows on trees! this book is awesome I loved it so much!! I don't really know how to explain it, it is so great. I HIGHLY recommend it for people who like fantasies and fiction stories. it isn't all one story though. every chapter is different characters with different situations and that's what makes it the best! It took many months of a couple of pages each night, but Connor and I finished his first real book. When he can actually understand the words, I'll wait until I can have a conversation with him about why it's okay to drown people, squish them flat, and dismember them in this book but not okay in real life. I absolutely appreciate the whimsy though. I think this book is really funny.It is also really funny.This book is fantasy.The Monarch of Mo goes to fight the Purple Dragon, which has just eaten all of the caramels in the land. The Dragon bites off his head, and the King is forced to go home headless. The king plans to destroy Mo.This book is really enjoying to read. I liked this book, but it was not my favorite. I definitely loved OZ much better. The one part I really liked about the kingdom of MO was the magical aspect of the land itself - hats, clothes, rings & animal crackers growing on trees. Root beer rivers, milk lakes - All the things I would want for myself in my magical kingdom!! A book by the talented Frank Baum, author of the Wizard of Oz. In this book we had another chance to visit one of his world's. I enjoyed this version of the book because of the illustrations. Quirky at times, I enjoyed being taken on another adventure. Good but not great. Pretty inventive at times. You can tell that this was originally meant to be a set of short stories rather than any kind of connected narrative. Because of that, it suffers a bit. Still, pretty good overall. How could you not love the magical land of Mo, with its rootbeer rivers and ponds of custard? Amusing stories set in a wonderfully imaginative land (though I did feel a little sorry for the Wicked Wizard - he just wanted to be taller so no one would laugh at him!). A series of fantasy adventures aimed at fairly young readers, very silly, but fun. Each segment is short, so they might make good bedtime reading. Emma says kind of silly, but also kind of funny. Ian thought it was cool that things like cupcakes grew on trees and there were rivers of root beer. Predating canonical Oz, this book is gut-busting hilarious. No veiled Populist Manifesto here. Nothing but delightful nonsense! Amusing stories about the fantasy land of Mo. Amusing, but some stories were just ridiculous. A quick, fun, clever set of short stories. A nice complement to The Scarecrow of Oz (which partially takes place in the Land of Mo). Had this read to me when I was a kid. Not nearly as charming as the OZ books and probably aimed at younger readers. Some of Baum's earlier writings, fun and fanciful, and you can see the beginning of many of the Oz stories here. One of the coolest fantasy books I have ever read. It is by Frank L. Baum that wrote the Wizard of OZ. Very cool and a very little known book.On the hardcover shelf. This is one of Ben's childhood books and it was so fun to read together. Very creative and fun! L. Frank Baum Frank Ver Beck Martin Gardner - also wrote under the name Edith Van Dyne, Floyd AkersLyman Frank Baum was an American author, actor, and independent filmmaker best known as the creator, along with illustrator W. W. Denslow, of one of the most popular books in American children's literature, The Wonderful Wizard of Oz, better known today as simply The Wizard of Oz. He wrote thirteen sequels, nine other fantasy novels, and a plethora of other works (55 novels in total, 82 short stories, over 200 poems, an unknown number of scripts, and many miscellaneous writings), and made numerous attempts to bring his works to the stage and screen.